The Struggle for Food Sovereignty explores the problems faced by Southern and Northern family agricultures in the current neoliberal era. The contributors, who include Samir Amin, João Pedro Stedile and Utsa Patnaik, base their arguments on an understanding of the revival of peasant struggles for their social emancipation and legitimate right of access to land and food. This collection is a response to the confusion which reigns surrounding how these urgent, global problems are understood and offers solutions as to how they should be approached. It understands that while there are common traits in how global capital goes after profit, the receptions on the ground differ. The authors, all experts in their fields, express the importance of the co-operation and cohesion of the various struggles taking place in different parts of the world, and how they must share a common vision for the future. 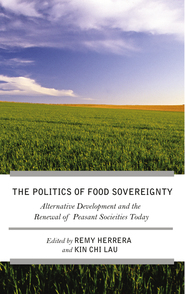 The Struggle for Food Sovereignty – Alternative Development and the Renewal of Peasant Societies Today, (en anglais), ouvrage codirigé avec K.C. Lau (contributeurs : S. Amin, G. Choplin, S. Moyo, U. Patnaik, J.T. Sit, J.P. Stedile, P. Tetoe et E. Wong), Pluto Press, 182 p., juillet 2015, Londres. ISBN : 978-074-533-594-0.